- 424 pages covering the nation from coast to coast, with 25 fantastic back road tours designed for motorcyclists. Each chapter contains information on historic sites, attractions, restaurants, lodging, dining, nightlife, the best roads from Point A to B, and reference sections for travel, tourism, and motorcycle-related resources. 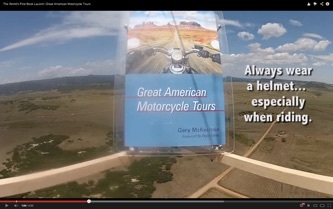 Great American Motorcycle Tours and High Altitude Science of Colorado Springs, Colorado, made history with the world’s first literal “book launch” -- sending the completely revised and updated 5th edition of the nation’s best-selling motorcycle guidebook on a pioneering journey. As stunning as the scenery of a good two-wheeled, two-lane road trip is the GoPro footage captured as the book left earth on a two-hour journey to the edge of space. 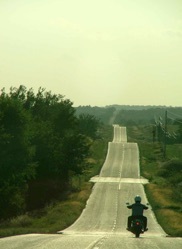 That’s one small step for a writer -- one giant leap for motorcycle touring! Few books reach a second edition - much less a fifth. Thanks to the passion of motorcyclists and their desire to explore America, the fifth edition of Great American Motorcycle Tours is helping readers around the world map out not just the ride of their life -- but 25 of the best back road rides in the United States. Each fact has been checked and literally thousands of prices, hours, phone numbers, web sites, and details on road trip information have been updated, created, and are ready to lead you all points of the American compass. Ride safe, enjoy America, and thanks. On the morning of May 3rd, 1914, Erwin ‘Cannonball’ Baker fired up his 7-hp Indian and headed east from San Diego. His destination? New York City. The bet was that he couldn’t cover the distance in less than 20 days. He did it in 11. Follow me as I join a group of riders as we honor Cannonball by retracing his ride.